My kids were really craving Asian noodle soup today, so I made a small pot for them, it was such a hit, they begged me to make some more, so second time around, I measured and wrote stuff out and took pictures so that if nothing else I can duplicate it next time I want to make it again. 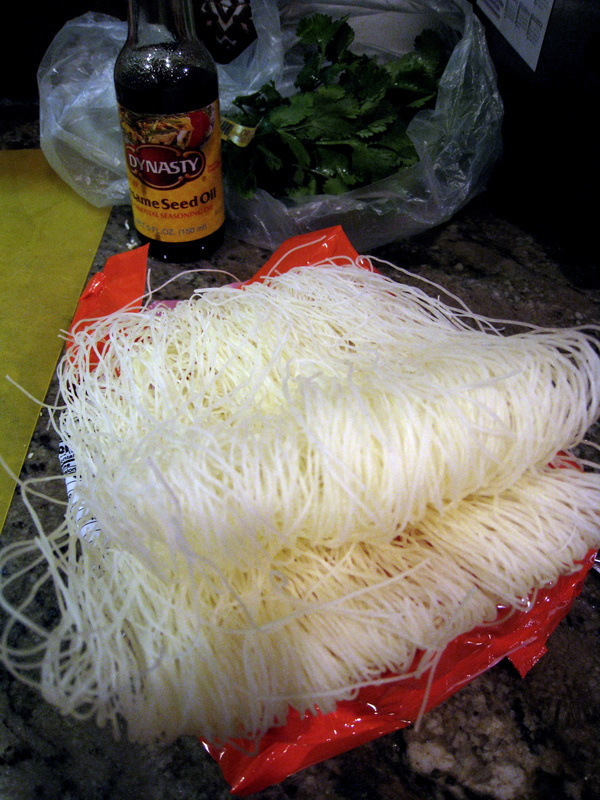 a drizzle of toasted sesame oil (you don’t want to put too much as it will overpower the taste) about 1/2 tsp. 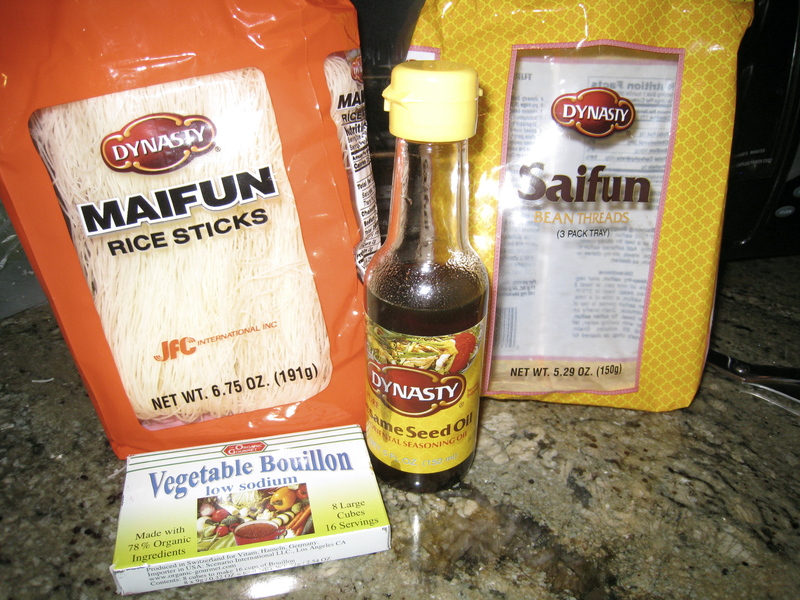 Rice Noodles, Mung Bean Noodles, sesame oil, veggie bullion cubes. 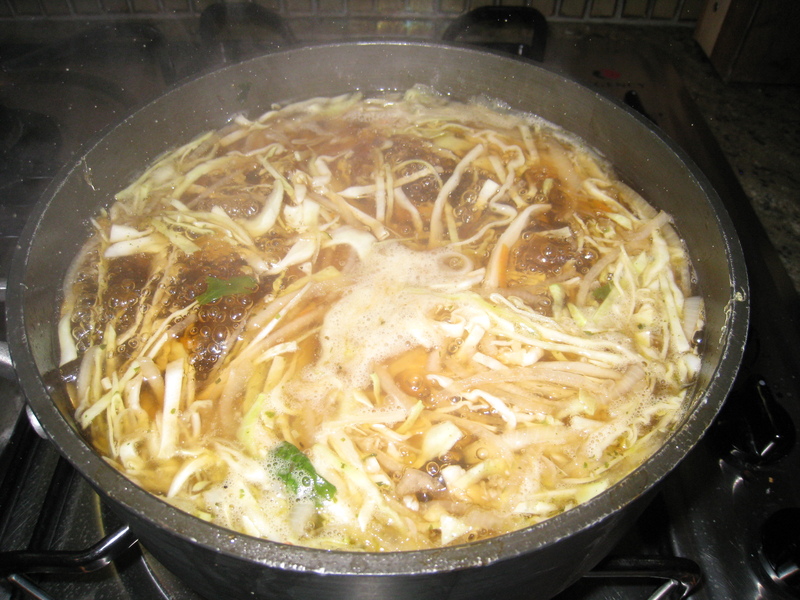 Drop the bouillon cube in 6 cups of water, add the lime juice, the soy sauce, sesame oil and salt and bring it to boil, meanwhile prepare the rest of the ingredients. 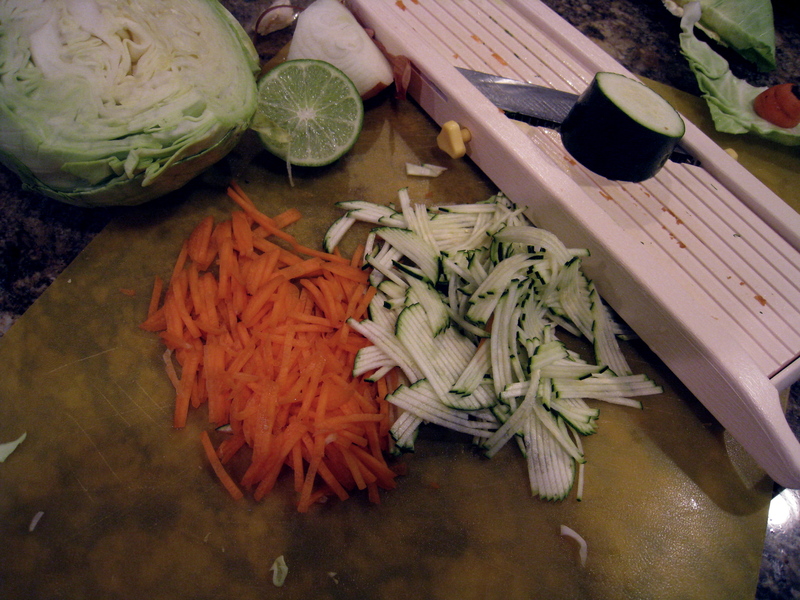 Whisk the broth to make sure the bouillon cube has completely dissolved then add the veggies as you finish slicing and cutting them. 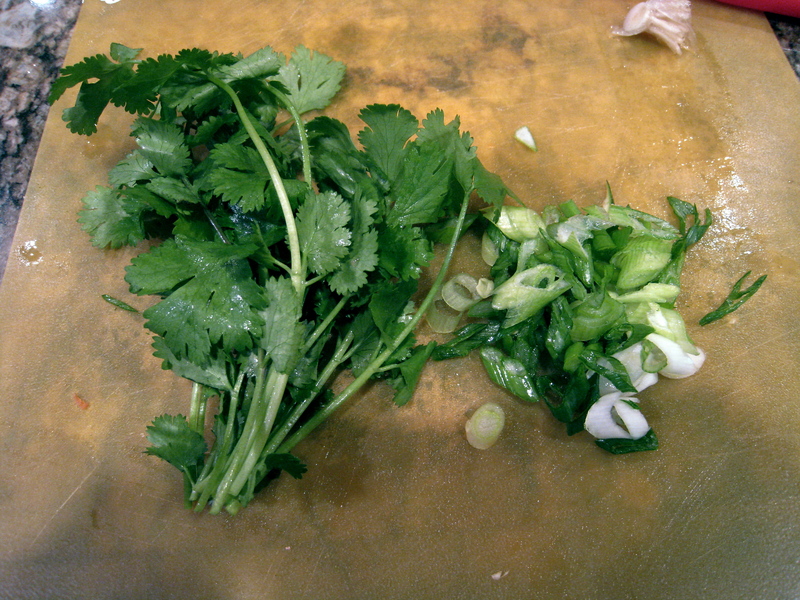 once the water boils, turn off the stove, add noodles, the green onions and cilantro, cover the pot and let it sit for 10 minutes. 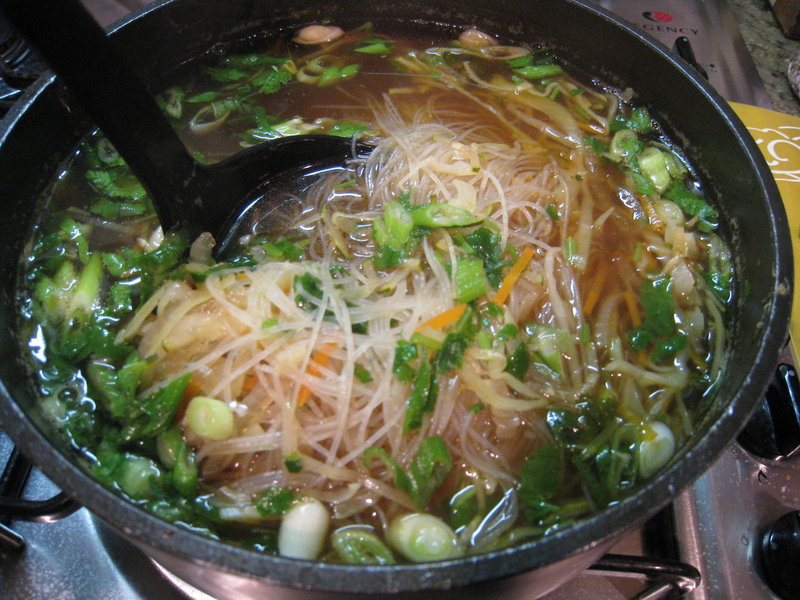 Once the noodles have expanded after about 10 minutes you may serve the soup. 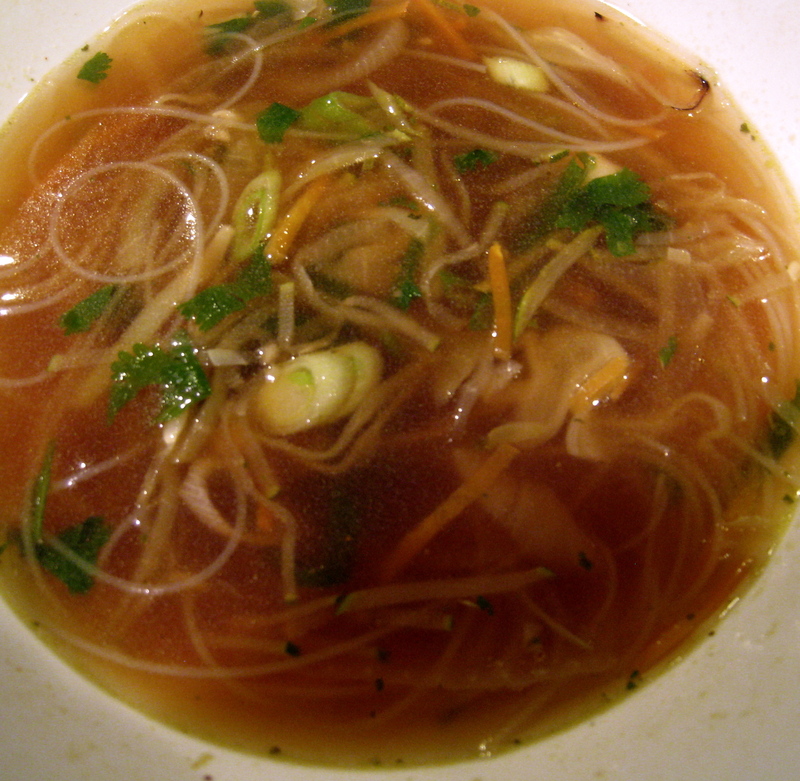 With the cold weather, soups just hit the spot! I hope you enjoy this one. Heat the soup pot, when very hot add the olive oil then saute the onions, zucchini, garlic and the tomatoes, add the water and the rest of the ingredients and bring to boil, once boiling, lower heat to the lowest setting and let simmer for 1 hour. 2 tsp. Amchur (dried mango powder found in Indian markets) (mix the poweder in some warm water first then add it to the soup so it doesn’t clump). About 2 Tbs. of Olive oil as garnish at the end. Dry saute’ the onions, stirring occasionally, once lightly brown, add the water and the rest of the ingredients excluding the fresh herbs and olive oil. Once you bring it to a boil, turn down the heat and let it simmer for about 30-45 minutes. Turn off the heat and let it rest for about 5 minutes. Add the cilantro, mint and olive oil, stir and serve.